Peruse our latest issue! We’ve rounded up some of our favorite Southern California social media influencers in our newest feature, Influencer Spotlight.Find out how your zodiac sign likes to travel in Traveling and Astrolo-ging. This issue, the LEFAIR team is taking you to Palm Springs, California where we stayed at the beautiful La Serena Villas and dined at some of our favorite Hot Spots! Check out our Editor in Chief, Tracy Kahn‘s photo shoot with model Cameron Rorrison in Postcards from Palm Springs. Our shopping guides will keep you from getting barked at (no pup intended)! Take a peep at Pamper Your Pooch and Nice, Naughty, and Needy. 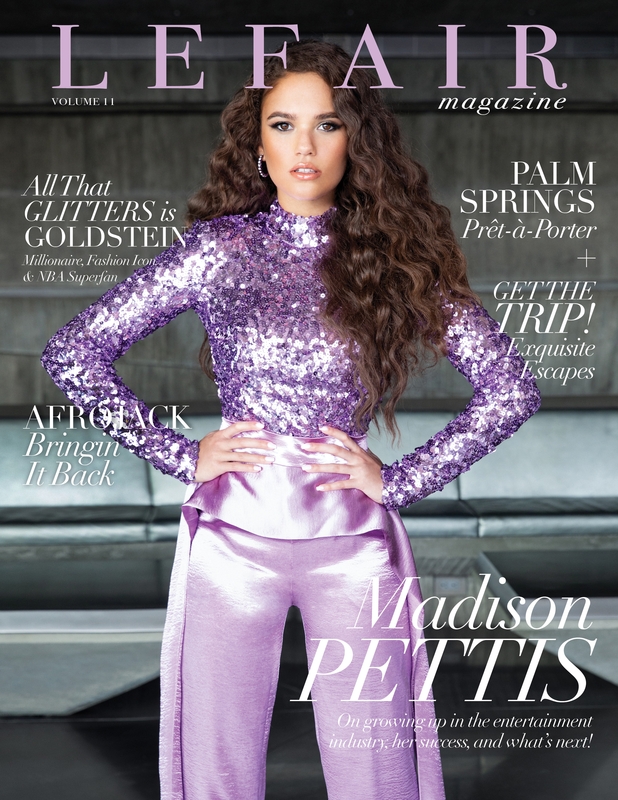 Our cover shoot with the sweet and kind Madison Pettis took place at the iconic Sheats-Goldstein residence. Madeline Rosene’s interview with James Goldstein tells the story about the mysterious fashion icon behind the house in All that Glitters is Goldstein.